L-R: Katie Aitchison of Savills, Edward Kennerley of Knight Frank, Rob Richardson and Steven Smith of St. Modwen, Matt Watkins of ProSurv and Martin Watson of GMI. 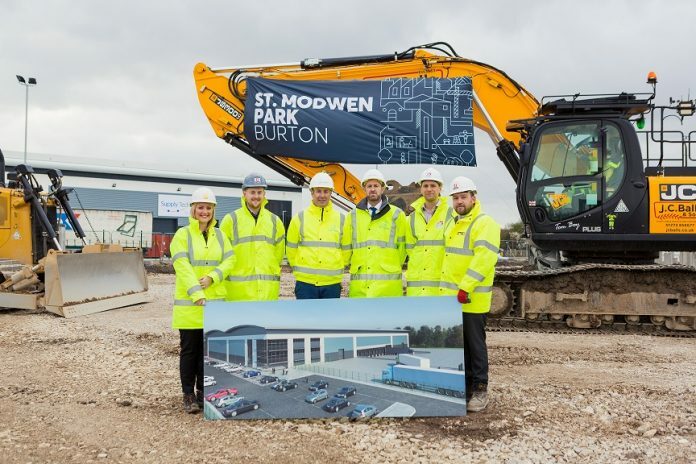 Developer and regeneration specialist, St. Modwen, has started work on its 103,000 sq ft distribution unit at St. Modwen Park Burton (formerly known as Burton Gateway). The new speculative unit, which is being built by GMI Construction Group, will include a 50m deep yard, 10 dock levellers (including 2 euro-docks) and grade A office space. Due to be completed this September, the unit further expands the industrial and logistics offering at the 1 million sq ft site. Once occupied, it could create in excess of 120 jobs in addition to the significant number of construction jobs created during the build. Work begins just a month after St. Modwen announced it had attracted two new tenants to the Park, with Supply Technologies taking a 25,446 sq ft unit and Keylite Roof Windows leasing a 40,730 sq ft unit, both of which were delivered as part of the second phase of development. Savills and Knight Frank are marketing the scheme on behalf of St. Modwen. St. Modwen Park Burton already has more than 200,000 sq ft of space and is home to major names including Hellman Worldwide Logistics, who occupied the first unit in 2016.